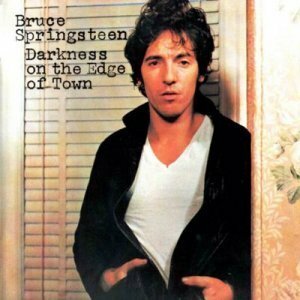 Album: Darkness on the Edge of Town. It seems ridiculous nowadays since bands like The Arcade Fire waste their youth and influence by taking three years between albums, but the three-year gap between Born to Run and Darkness on the Edge of Town felt like a big deal. So much time! Especially as the scruffy bohemian dude grinning holding his guitar on the former album was replaced by the clean-shaven dude staring you down. When I first saw the magazine ads for Darkness, I couldn’t even believe it was the same guy. Which made thematic sense: if: Born to Run often felt like a huge party, then Darkness on the Edge of Town felt like the reason that people needed that party. And as such, it took a long time for me – a couple of decades, really – to fully grok how great it was. The one Darkness song that I loved unreservedly from the start is easily the most unconventional song on the entire album. Neither a straight-out anthemic rocker nor a slowly-burning ballad, “Candy’s Room” starts quietly, and then suddenly explodes into a big Max Weinberg snare drum hook. Just when you think you’ve got a handle on it, it gets ripped in half by one of Bruce’s most out-front guitar solos, stopping the whole thing dead. After that, everybody’s jostling each other trying to get to Candy’s room first. In the end, Max Weinberg wins by virtue of sliding on his snare drum hook while Bruce slows himself down by bouncing back-and-forth between the speakers.